Wills Lifestyle India Fashion Week SS'13 - Updates ! | The Shopaholic Diaries - Indian Fashion, Shopping and Lifestyle Blog ! 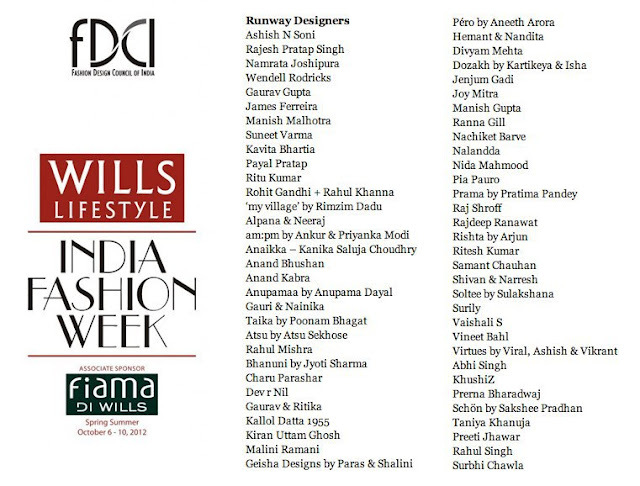 Wills Lifestyle India Fashion Week SS'13 - Updates ! So once again, the most prestigious and fashionable event of the season - Wills India Lifestyle Week Spring Summer 2013 is around the corner, and is scheduled from October 6th - 10th, 2012 at Hall No.18, Pragati Maidan, New Delhi. With each season the FDCI organized WIFW has shown a constant increase in participation by both established and young designers; and appreciation by the media& buyers. The venue will once again recreate exquisite lounges, restaurants and welcoming café counters for the guests to indulge along side the days filled with runways shows by best in Indian fashion. I'll be bringing up regular updates from the event as and when they come. Also, there would be a Giveaway up soon. But don't forget to participate in the Favordeal International Giveaway which ends soon.